So I got my new gaming PC a couple of days ago for Battlefield 1 and PUBG, everything else works fine but there seems to be some kind of dynamic contrast ratio or auto brightness I can't disable, basically the contrast ratio or brightness of the screen changes slowly (10 - 20 Hz) depending on the color or grey scale of the content on the screen, and I suspect this is the cause for the frame rate drop when I play games (with 1440p and ultra graphics settings in both games the fps is around 60-70), both GPU and CPU temperatures are normal (60 degrees Celsius for GPU and 40 degrees Celsius for CPU), I have tried everything I can find on Google but I just can't disable this feature. Please share any thoughts you guys have, thanks! Similar issues I found online: Can't put them here but in the reddit post there are links to a couple of similar issues. Turn on the PC, whenever the color or brightness of the contents on the screen is changing the contrast or brightness of the screen changes slowly. There is no such option in the monitor menu and switching to another monitor I have didn't solve the problem so I'm pretty sure it's not related to the monitor. I don't have Power4Gear on my computer. The next thing I'm gonna try is reassemble the PC, reinstall the OS and drivers and prey. Click on 'Intel(R) HD Graphics Control Panel Service' from the list. Click OK, and restart the computer. You might have to do this again if the windows updates your Intel graphics driver. The implementation of dynamic contrast ratio (often implemented in conjunction with changes in screen backlight levels) is specific to video driver software. I usually don't post on these questions, but I have been INFURIATED by this problem for so long and I finally figured out the solution, and I feel a moral obligation to post it. Like OP, I tried changing adaptive brightness in the power plan, I tried fiddling with NVIDIA control settings, intel settings, etc. Nothing worked. But then I found the solution! The problem isn't your laptop manufacturer, it isn't intel, it isn't NVIDIA. It is windows 8 & 10. It is called Windows "Sensor Monitoring Service". So I'm not a computer guru and am I sure there is a better way to do this, but after reading that link (which talks about restoring the feature) I deduced that the file responsible was safe to delete. So I deleted the file and problem solves! The auto-dimming or whatever problem went away, with no discernible issues, and I couldn't be happier. Just go to the windows/system32 folder, look for the file "sensrsvc.dll", and delete it. Empty recycle bin/run CCleaner, restart, problem solve! Again, there problem does exist a way to disable it without deleting it, but I'm not savvy enough to figure it out on my own. 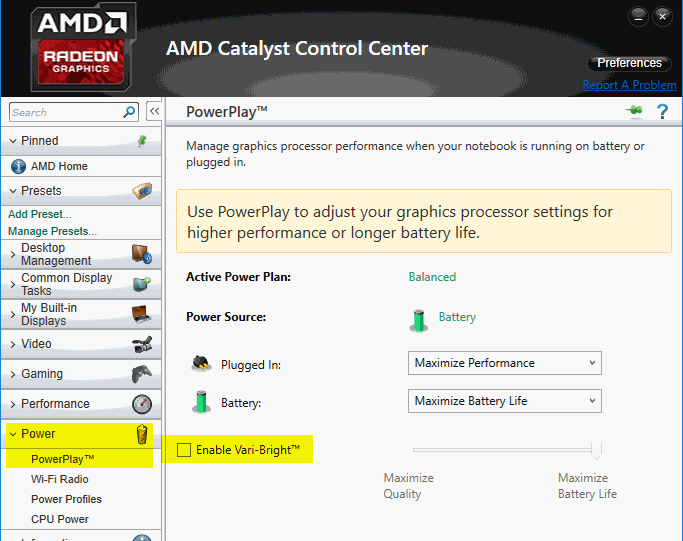 what worked for me was to disable "Diplay power saving technology" from Intel HD Graphics control panel. you can access it from Power settings of the Intel HD Graphics control panel. Not the answer you're looking for? Browse other questions tagged windows-10 drivers display nvidia-graphics-card contrast or ask your own question. Why does my processor on Windows 10 run hotter than Windows 7? Changing the resolution on my desktop changes the actual size of the screen displayed?